The Cedar Valley Cloggers are a dance group which strives to preserve traditional Appalachian clogging. Based in Wooster, Ohio, our group has been dancing for almost 40 years. We have dancers of all ages – children to seniors. Our dances, performed in lines, mixers, squares, and sets, are fun and energetic and are a factor in our group’s popularity with the audience. We perform at fairs, festivals, local schools, nursing homes, and various other functions. 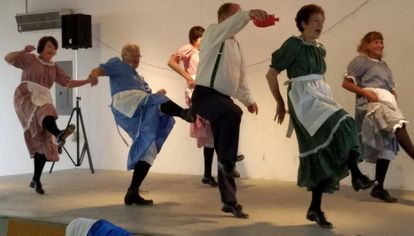 We have danced not only in and around Ohio, but in several other states and Austria! We also offer classes for beginners, children, and performance clogging. LEARN TO CLOG! Click "CLASSES" tab above for more info. Book us for your next event! Click the "CONTACT US" tab above. Visit us on Facebook DOWNLOAD OUR BROCHURE!! The tune is "Lost Indian ", played by fiddler Jake Krack, with Carl K. Nestmann on acoustic bass guitar, Bob Buckingham on banjo, Todd Clewell on guitar, Suzanne C. Gates on bass, and Micah Dunn on mandolin.